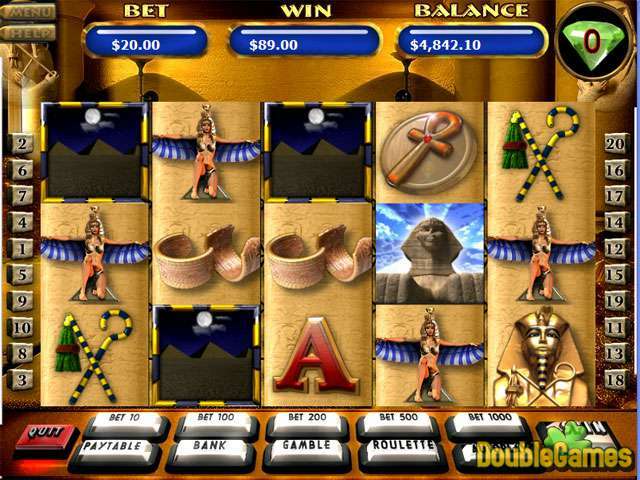 Tuts Treasure-The youthful Pharaoh and ancient pyramids will entice you to play for the honour of Cleopatra - Egyptian Queen. Save Cleopatras Jewels, then defeat the mighty Asp in the Serpent Spins and the riches of Ra's Treasure will be yours for the taking! The Ancient Pyramids symbol is a scatter symbol, which will pay in ANY position on any line. The Eye of Ra symbol is a wildcard which substitutes for all symbols except scatters. ...... in the Special Edition) starts Cleopatra's Treasure Feature. When the Feature starts, you are awarded 10 free games - the Yellow Jewel Games. During these 10 free games you need to collect 15 or more yellow jewels. These symbols can appear in any position on any reel. If you collect the 15 jewels you automatically progress to the next level of the feature. During the Cleopatra's Jewel Feature, Cleopatra herself will appear in the game, substituting for all symbols except scattered pyramids. All winning paylines where Cleopatra appears are paid out at FIVE times normal pays. During the feature free games, the Pharaoh Tutankhamen expands to his full size sarchophagus on every reel. After any free game spin, if he is covering an entire reel his sarcophagus will open and reveal a magnificent bonus prize - free spins or even Pharaoh sized piles of free credits! Qweas is providing links to Pokie Magic: Tuts Treasure n/a as a courtesy, and makes no representations regarding Pokie Magic: Tuts Treasure or any other applications or any information related thereto. Any questions, complaints or claims regarding this application Pokie Magic: Tuts Treasure n/a must be directed to the appropriate software vendor. You may click the publisher link of Pokie Magic: Tuts Treasure on the top of this page to get more details about the vendor.